A picture crossword puzzle game starring Mario and Wario. 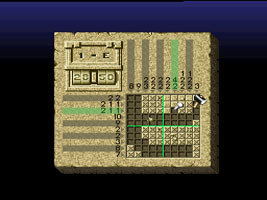 You are presented with a grid with numbers along each row and column. The numbers represent solid lines that must be filled in, Multiple numbers mean solid lines must be separated by at least one space. In the Mario's Picross stages you receive a time penalty for making a mistake. In the Wario's Picross stages you receive no penalties or notification for making errors. There are over 300 puzzles to play in total, with more stages unlocked as you clear them.